Hen House is one of RTG’s (Real Time Gaming’s) latest progressive jackpot slots, with the twin progressive jackpot feature being the highlight. The developers have chosen to go with a farmyard theme here, but this isn’t all about sheep’s and cows. Instead, Henhouse is about a wily old fox, who is desperately trying to get into the coop, and a jolly old farmer who doesn’t seem to be too overly concerned about him. If one was to judge Hen House simply on the graphics, the style in which they have been created, one would say that it is standard. However, the fact that they have chosen to use imagery that most gamers won’t ordinarily have seen in a farm-yard themed slot before is actually quite a winning idea. The slot is colourful, and well designed, and doesn’t appear too cluttered, even though there is a lot going on. Bets are constructed on a coin value x number of coins x paylines basis here. Coin denominations start out at only 1¢ at their lowest, and can’t be raised higher than $1 per coin. The player can only wager 1 coin per line, so their maximum wager is never going to exceed a total of $25 per spin, given that there are 25 paylines. 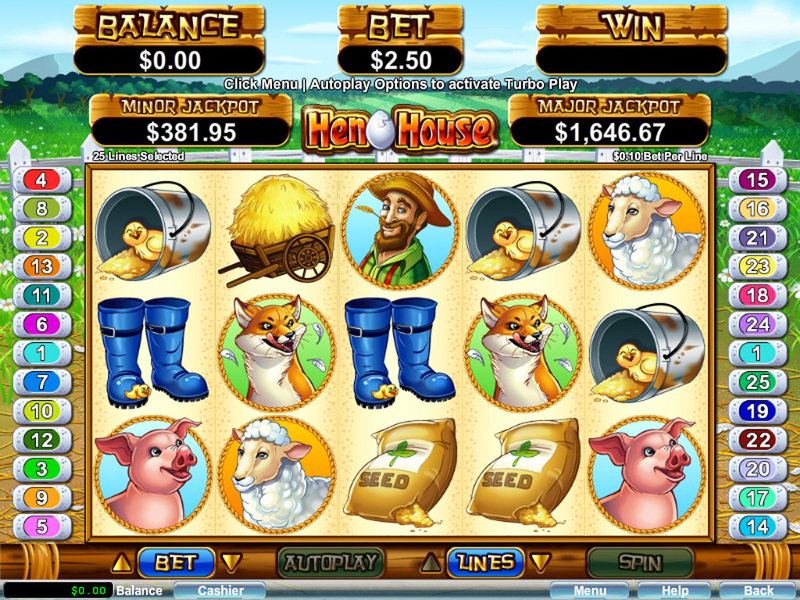 At its lowest cost, players can have a stab at the Hen House video slot, for as little as 1¢ per line, per spin. Gamers should keep an eye out for the hen icon, on the second, third and fourth reels. This icon is the wild symbol, it is stacked on those middle three reels, and will substitute for all symbols except the scatter. The scatter icon is the egg symbol. Scatter symbols multiply the total bet you have staked. Players can pick up multipliers of 2x, 20x or 200x their total bet, if they land 3, 4 or 5 of them, respectively, anywhere on the reels. 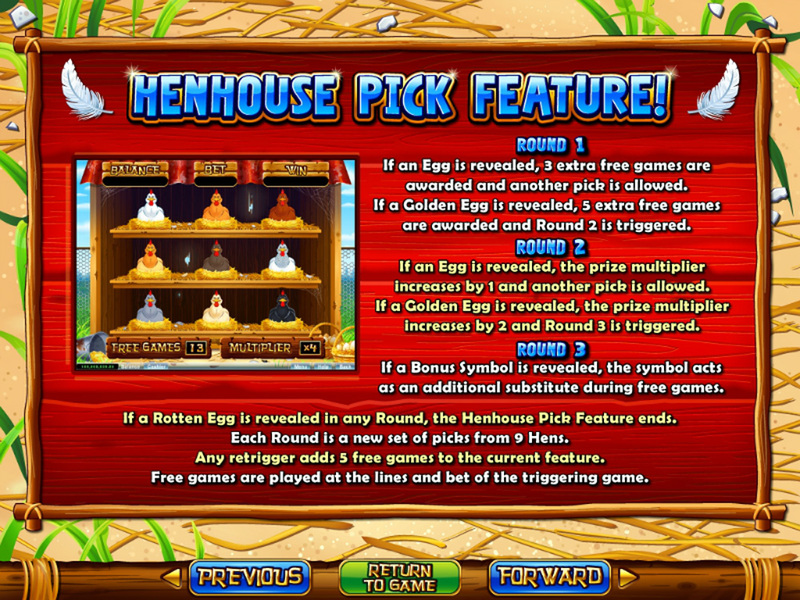 If you land 3 or more eggs anywhere on the reels, you will also trigger the Hen House Pick Feature. 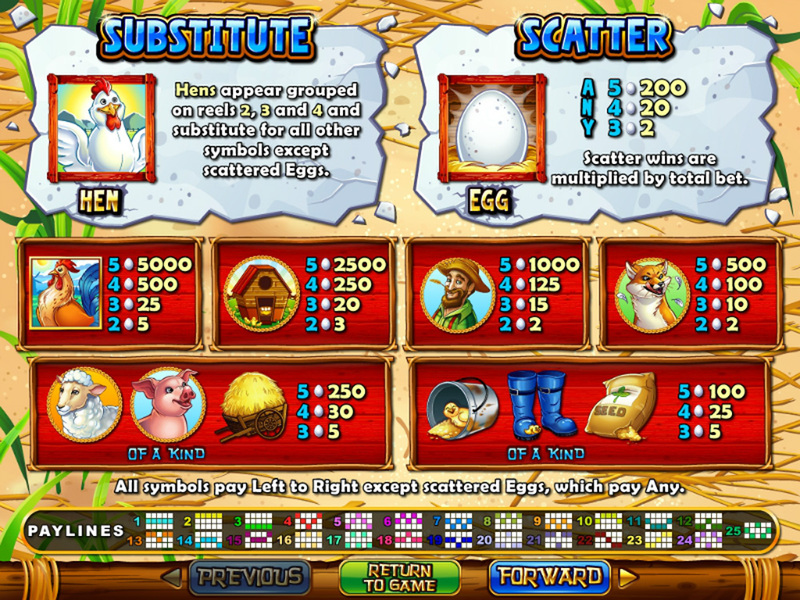 In this bonus round, players can select from 9 hens to locate regular eggs, golden eggs, bonus symbols, or rotten eggs which end the bonus round. 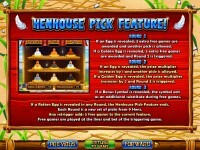 The Hen House Pick Feature starts with 5 free spins x1 and three rounds of picks to increase those numbers. In the first round of picks, finding an egg awards 3 extra free spins and another pick is given. If a golden egg is found, 5 extra free spins are awarded and round 2 is triggered. In the second round, finding an egg increases the multiplier by 1 and awards another pick. If the player lands a golden egg in their pick, it will increase the multiplier by 2 and trigger round 3. In the final round, finding a game symbol will make that symbol wild during the free spins. 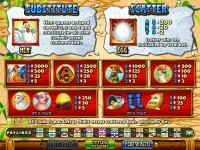 Free spins will start once a rotten egg is found, or the player completes round 3 successfully. There are two progressive jackpots to win here, a minor and a major progressive jackpot which are awarded randomly, at any bet level. Increasing your bet size will increase the chances of winning the progressives. 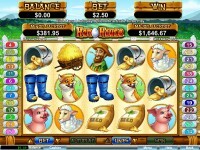 Hen House is actually a pretty decent slot to play, it should be good fun for most players. You can play it yourself and see you if you like it at any of these trusted RTG Casinos.